First there was Cats. Now we have humans playing Dogs. In Joe Ferraro's whacky Diamond Dogs, we watch the behind the scenes antics of an annual dog competition, not called Westminster's, through the perspective of man's best friend. Diamond Dogs is an ensemble comedy about a pack of pups competing for doggy glory. 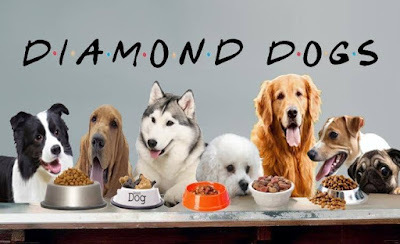 Between a will-they-won't-they romance between a Border Collie and a Golden Retriever, a high-energy Jack Russell Terrier, and an evil mastermind in the form of a Bichon Frise, Diamond Dogs is everything you could want in a campy comedy. Only that's not exactly how it was executed. Diamond Dogs is not quite sure what it is. Ferraro is a smart scribe when it comes to comedy. But the reality is, these are humans playing dogs. Diamond Dogs desperately needs to be a laugh-a-minute comedy. Because when it’s present, Ferraro's writing shines. The antics can go even further over the top. The struggle in this format is that when Ferraro infuses human situations for these dogs, it's just not funny. That being said, if you turn this script into an Adult Swim late night cartoon, Diamond Dogs is a cult classic. Just close your eyes and imagine cartoon dogs talking about these real life situations. It's hilarious! But in theatrical form, Diamond Dogs is not nearly as strong as it can be. And there is great worth and potential within. The other slight problem is the consistency of this world. With Diamond Dogs virtually being "Toy Story" for pups, the switch from dog perspective to human presence needed a stronger shift. For example, the explanation of the naming of dogs is a bit farfetched. The joke is if the dogs refer to one another through their dog name. Imagine having a serious conversation and use the name Fluffy or Sparky. But giving them human names and then learn the humans are just ridiculous namers, it loses the comedic steam. Additionally, going further in the characterization is essential. As a whole, implementing more dog mannerisms help to marry the worlds. The reality is that walking on all fours is annoying for the whole show. But when the owners arrive, it's time to drop down. Director Megan Magee blended the styles well, though if it was essential to keep all the dogs inactively present on stage during their "off" scenes, more attention needed to be paid to what they were doing in the background. Though some actors took it upon themselves to find a dog action. Nothing is funnier than watching a human actor chew a bone like a dog. That takes commitment. The ensemble of eight has a lot of fun playing pretend. By far, the standout of the bunch was Andrew Orsie as the adorably impressionable ball of energy, Sonata. Orsie is the definition of an effortless character actor. The attention to detail was exceptional, crafting a fan-favorite Jack Russell terrier. Between circling to chase his tail, pawing at his fellow dogs, and falling asleep as dogs always do, Orsie's Sonata was fully fleshed out. He deserves credit simply for the amount of running around he did. If you don't want to give him a belly rub, you likely are missing a heart. Though she didn't quite get the laugh lines in the text, Ariel Judson as Allie was a wonderful ingénue dog. Judson had a sweet charm about her. The scribe himself played the gruff pug Frank. He had some of the bigger comedic plot points that resulted in some huge laughs. As the perfectly evil Marcus the Bichon Frise, Zach Rich allowed a vocal inflection to wonderfully carry the character. In some alternate universe, Rich's Marcus would be the perfect lapdog to an evil villain. As a whole, much credit should be given to costume designer Kaitlyn Biancaniello. She gave each character a personality that not only resembled the real-life dog but worked for each individual. Whether it was scripted or not, another missed comedic moment was waiting to reveal the dogs' costumes later on. Diamond Dogs may not win Best In Show quite yet but give it some time and it certainly can. Joe Ferraro has great potential with his text that with some refining will be making audiences bark instead of growl. Crass and crude is the right brand. Sentimentality is not.